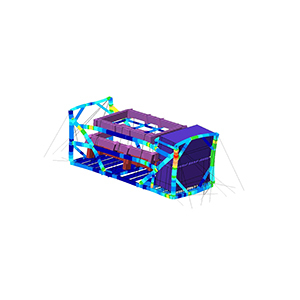 FEA-Solutions (UK) Ltd - Finite Element Analysis For Your Product Design | 161: Transport Cradle for Submarine Parts Stress analysis of cradle with payload subjected to transport accelerations. FEA model includes a detailed representation of the lashings used to strap the payload to the cradle, and the tie-down of the cradle to the aircraft. Report identified weaknesses and provided recommendations for improvement.